A weekday off from the workplace at the library and nice autumn weather led to a special treat for Ellie B aka Dogamous Pyle and I. 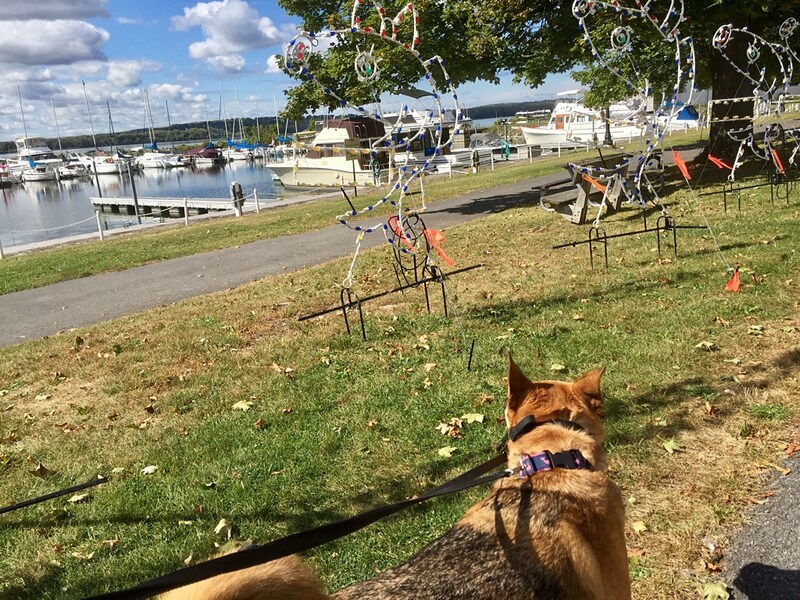 Our cherished rescue mutt was thrilled to hop in the car at A Bitty Better in the Liverpool neighborhood of Galeville for the couple-mile ride to Onondaga Lake Park. The workers have already started preparations for the annual Lights on the Lake extravaganza. That opens at the end of next month. The boaters have yet to pull their vessels out of the lake marina. The juxtaposition seemed to astonish my smart dog. Here it comes, lights almost ready to twinkle, Beth! Beautiful scene! I’m already Christmas shopping, but I dread the season change. My old bones don’t do cold very well. You do well to say ahead of the curve shopping, Apple Pie. Me, not so much. We humans are a bit confused by the signs of the seasons as well, Mark. We rescued a 3 year old terrier this past Spring, take him to local parks every day. It’s a sweet exercise for us all.